The following excerpt from "What Abstract Art Means to Me" was written by de Kooning for a 1951 symposium at the Museum of Modern Art. 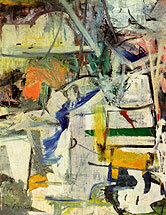 The full text was published in Willem de Kooning by Thomas B. Hess (MOMA, New York, 1968). In the old days, when artists were very much wanted, if they got to thinking about their usefulness in the world, it could only lead them to believe that painting was too worldly an occupation and some of them went to church instead or stood in front of it and begged. So what was considered too worldly from a spiritual point of view then, became later -- for those who were inventing the new esthetics -- a spiritual smoke-screen and not worldly enough. These latter-day artists were bothered by their apparent uselessness. Nobody really seemed to pay any attention to them. And they did not trust that freedom of indifference. They knew that they were relatively freer than ever before because of that indifference, but in spite of all their talking about freeing art, they really didn't mean it that way. Freedom to them meant to be useful in society. And that is really a wonderful idea. To achieve that, they didn't need things like tables and chairs or a horse. They needed ideas instead, social ideas, to make their objects with, their constructions -- the "pure plastic phenomena" -- which were used to illustrate their convictions. Their point was that until they came along with their theories, Man's own form in space -- his body -- was a private prison; and that it was because of this imprisoning misery -- because he was hungry and overworked and went to a horrid place called home late at night in the rain, and his bones ached and his head was heavy -- because of this very consciousness of his own body, this sense of pathos, they suggest, he was overcome by the drama of a crucifixion in a painting or the lyricism of a group of people sitting quietly around a table drinking wine. In other words, these estheticians proposed that people had up to now understood painting in terms of their own private misery. Their own sentiment of form instead was one of comfort. The beauty of comfort. The great curve of a bridge was beautiful because people could go across the river in comfort. To compose with curves like that, and angles, and make works of art with them could only make people happy, they maintained, for the only association was one of comfort. That millions of people have died in war since then, because of that idea of comfort, is something else. This pure form of comfort became the comfort of "pure form." The "nothing" part in a painting until then -- the part that was not painted but that was there because of the things in the picture which were painted -- had a lot of descriptive labels attached to it like "beauty," "lyric," "form," "profound," "space," "expression," "classic," "feeling," "epic," "romantic," "pure," "balance," etc. Anyhow that "nothing" which was always recognized as a particular something -- and as something particular -- they generalized, with their book-keeping minds, into circles and squares. They had the innocent idea that the "something" existed "in spite of" and not "because of" and that this something was the only thing that truly mattered. They had hold of it, they thought, once and for all. But this idea made them go backward in spite of the fact that they wanted to go forward. That "something" which was not measurable, they lost by trying to make it measurable; and thus all the old words which, according to their ideas, ought to be done away with got into art again: pure, supreme, balance, sensitivity, etc.